Energised massage therapist Kate Hughes took on the challenge of the HOKA ONE ONE half marathon last Saturday. 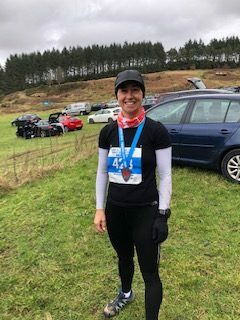 “Beautiful Afan forest was indeed challenging and the weather was harsh but I finished and felt proud of my achievement. Winter trail running is perfect to set you up for those Spring marathons. If you’re training for a marathon, particularly as your event grows closer, make sure you keep yourself in great condition with regular massages and rock tape if needed. You can book in directly with Kate HERE, treatment hours: Wednesdays 5.30pm-8.30pm and Fridays 5.30pm-7.30pm, at Energised HQ, please note Kate is having a well earned rest this week, appointments from the 27th Feb.